This student submission again comes from my student Alexandria Johnson. Her topic, from Algebra II: graphing square root functions. An interesting word problem that students should be able to solve after completing a lesson on graphing square root functions would be: “The Chandra satellite detected x-rays coming from the region of the sky containing the galaxy cluster JKS041. The electrons in the gas are emitting the X-rays, and colliding at high speed with the protons in the gas. The energy of the x-rays at the time they were emitted by the hot gas was 21,400 electron Volts (eV). This energy is shared equally between the electrons and protons. The speed of a proton is related to its kinetic energy by E = 1/2mV^2 where E is the energy in Joules, V is the proton speed in meters/sec, and m is the mass of a proton (m = 1.7 x 10-27 kg). About how fast are the protons moving? (Note: 1 eV = 1.6 x 10^-19 Joules)”. Students can arrange the problem into a square root function to solve for velocity: V=sqrt(2E/m). 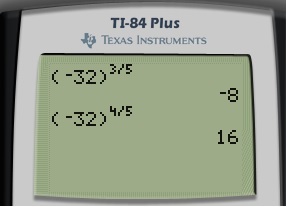 Using the information provided students can convert eV to E and solve for m. Once this information is found, students can plug in the numbers to solve for V. Note: this question is difficult and some students may struggle with the calculations. A simpler question about the relationship between kinetic energy and velocity could be used in place of this one. Question provided by https://spacemath.gsfc.nasa.gov/weekly/6Page70.pdf. In Physics, students will be able to use square root functions to describe the relationship between different variables. Having the knowledge of graphing square root functions will allow students to represent these relationships graphically. 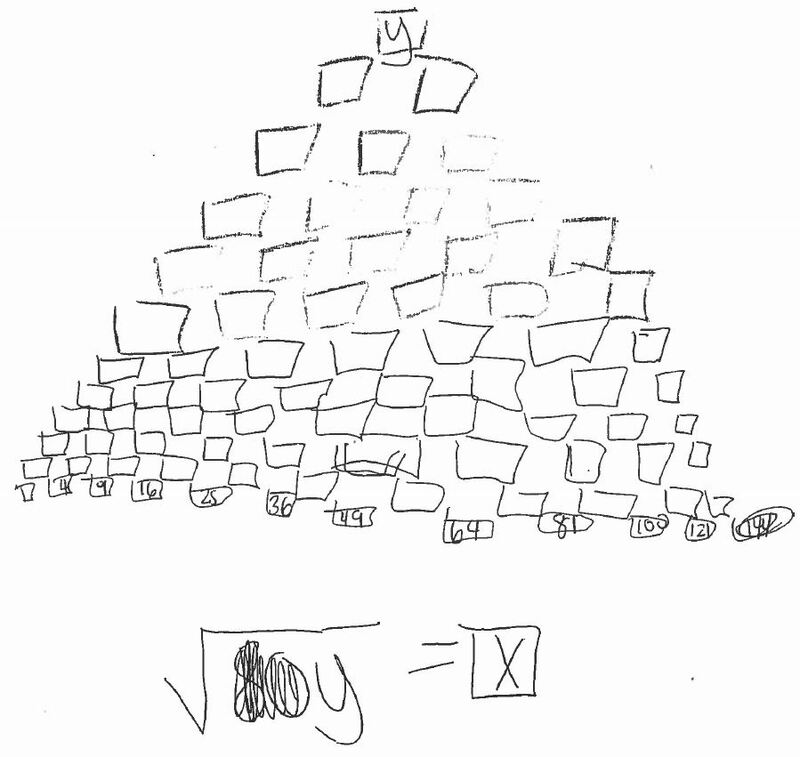 For example, to find kinetic energy, students use the formula E=(1/2)*m*v^2, where m=mass and v=velocity. Students can manipulate the equation to find v which would be v=sqrt(2E/m). Given m, students should be able to graph the relationship between v and E. When solving for volume, students can rearrange the equation into the form y=a*sqrt(x-h)+k, where h=0, k=0 y=v, x=E, and a=sqrt(2/m). knowing how to graph a square root function, students can graph this equation. A useful resource when creating a lesson about graphing square root functions is https://teacher.desmos.com/. This website provides teachers with existing activities that the students can complete. Also, it allows the teacher to create activities for the student. An activity that is already created for teacher use is called Polygraph: Square root functions. In this activity, students play a game similar to the board game Guess Who. Students pair up and are given a set of graphs of square root functions. Partner 1 chooses a graph. Then, Partner 2 asks questions about the graphs to try to find the graph that Partner 1 chose. Students compare various graphs and communicate these differences. Though the website doesn’t offer any other premade activities at this time, teachers can use the activity type “marble slides” to create an activity that shows how a, h and k affect the parent function of square roots. “Chandra Spies the Most Distant Cluster in the Universe.” Space Math, NASA, Chandra Spies the Most Distant Cluster in the Universe. Accessed 15 Sept. 2017. This student submission again comes from my former student Jessica Martinez. Her topic, from Algebra: square roots. There is a (sort of) holiday for square root days; sort of because square root days only come 9 time every century and this year we celebrated 4/4/16. Since it’s not as frequent as Pi Day, it’s a lesser known “holiday”, but even then, it still pops up in the news. I found this online article for a UK news site that described other square root-related fun facts in history. It also included a post from Good Morning America with the hashtag #squarerootday, which gave me this idea: I would like to encourage my students to participate in all of the fun square root-related activities that celebrate this day (if there was one that school year). The founder of square root day has suggestions that include but are not limited to: square dancing, drinking root beer out of square glasses, or even taking a drive on route 66. In the days leading up to this fantastic math-related day, I would consider giving my kids an extra credit point for posting a picture of themselves doing something square root related on the class twitter with the tag #squarerootday (or a post on some other class social media). If there wasn’t a square root day during that academic year, I still think it would be fun to tell my students about this holiday. My students should have already learned about perfect squares and their multiplication tables up to 12 or 13, at least. For a simple refresher, I could have my students color/highlight perfect squares on multiplication tables. Then taking the square root of something is the inverse of creating perfect squares, unless what’s under the square root sign isn’t a perfect square. Then what’s under the radical is something that they need to divide into its prime factors so that they can simplify. My students should have also at least learned about prime numbers, if not prime factoring. A way to solve square roots would be pairing up the prime factors under the square root so that you can “take it out” from under the radical; for my students, I could have them think of the square root sign as a jail cell, and the only way that the numbers could “get out” of the cell is if they had a “prime partner” to escape with (i.e. a pair of 2s, a pair of 3s etc.). So one of the oldest records of square roots in history would be The Old Babylonian tablet YBC 7289, which dates back anywhere from 2000-1600 BC. It depicts a square with two diagonals drawn and on the diagonals are numbers; when they are calculated, you get a very close approximation of the square root of 2 for the diagonal. 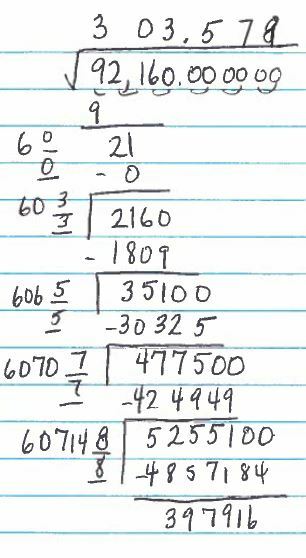 Their value for the square root of two was about 1.41421297; I could have my students quickly calculate the square root of two (about 1.41421356) and mention to my students that this is pretty impressive for a civilization without modern day technology. The fact that they used clay tablets for math calculations shows how little they had to work with. Yet Babylon was also one of the most famous ancient cities in Mesopotamia; it’s mentioned multiple times in the bible and they were pretty advanced in mathematics for their area, despite the lack of resources we have today. They used a sexagesimal number system, which is base 60; they could solve algebra problems and work with what we now call Pythagorean triples; they could also solve equations with cubes. Fowler, D., & Robson, E. (n.d.). Square Root Approximations in Old Babylonian Mathematics: YBC 7289 in Context. Historical Mathematica, 366-378. Retrieved September 9, 2016, from https://math.berkeley.edu/~lpachter/128a/Babylonian_sqrt2.pdf. 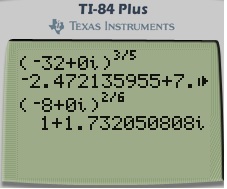 And, just to see if I could do it, they wanted me to do all of this without using a calculator. But they were nice and allowed me to use pencil and paper. 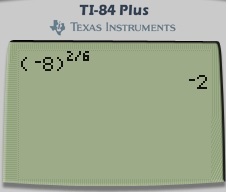 I’m almost done… except my students wanted me to find the square root of this number without using a calculator. This student submission again comes from my former student Tiffany Jones. Her topic, from Algebra: square roots. It gives the students another tool for their toolbox of numerical reasoning, practice using formulas, reviews long division by hand, and strongly encourages students to remember the perfect squares. I think that introducing this idea as an engage could intrigue student to wonder why the formula works and to wonder what else they are able to do quickly by hand. Fort Bend Tutoring’s YouTube channel offers videos on a wide verity of high school mathematics topics and courses. The videos cover several examples. They are engaging, not dry and there is also a “theme song” to the videos. I feel that these videos can sever as a great addition to lessons as extra help to the students. D.1 What interesting things can you say about the people who contributed to the discovery and/or the development of this topic? The following story was first told to me in a calculus one course. While the telling of the story was to serve as amusement and did not directly relate to the topic of the day, it stuck with me. It comes to mind frequently when working with the Pythagorean theorem and with irrational squares. And when given this assignment, I saw square roots as an option, this story again came to mind. I think having an interesting story cross my mind makes a problem overall more fun. I would want to give that to my students. The article “The Dangerous Ratio” by Brain Clegg does a wonderful job of telling the story, its implications, and gives a mock dialogue so reads can work through the logic. At the end of the article, there is a link to an activity about the proof that the square root of 2 is irrational. I really like the idea of a flipped classroom and hope to be able to practice it in my classroom. While a completely flipped classroom will take some time to implement, videos such as Math Antics’ “Exponents & Square Roots” will be a great place to start. This particular video address a previously learned topic, namely exponents and relates it to the new topic. It provides definitions and visuals to remember how the terms relate to each other and how to read the symbols. It goes through several examples of varying level and shows the viewer how to use technology such as calculators to solve hard problems. In addition, the video addresses some common misconceptions such as mistaking the root sign and the division sign. Moreover, it ties everything together with a quick review at the end. One of my favorite aspects so of flipped classrooms, is that the student can review the video over and over. Math Antics does an excellent job of talking the math out to the viewer. The animations are amusing yet helpful. While a lot of information is covered, the video is not dry. where this last integral is taken over the complex plane on the unit circle, a closed contour oriented counterclockwise. In these formulas, and . (Also, is a certain angle that is now irrelevant at this point in the calculation). This contour integral looks complicated; however, it’s an amazing fact that integrals over closed contours can be easily evaluated by only looking at the poles of the integrand. In recent posts, I established that there was only one pole inside the contour, and the residue at this pole was equal to . This residue can be used to evaluate the contour integral. Ordinarily, integrals are computed by subtracting the values of the antiderivative at the endpoints. However, there is an alternate way of computing a contour integral using residues. It turns out that the value of the contour integral is times the sum of the residues within the contour; see Wikipedia and Mathworld for more information. Once again, this matches the solution found with the previous methods… and I was careful to avoid a common algebraic mistake. In tomorrow’s post, I’ll discuss an alternative way of computing the residue. I’m doing something that I should have done a long time ago: collect past series of posts into a single, easy-to-reference post. The following posts formed my series on the different definitions on inverse functions that appear in Precalculus and Calculus. Part 11: Pedagogical thoughts on teaching arcsine. Part 25: A proof for why the formula in Part 24 works. I’m using the Twelve Days of Christmas (and perhaps a few extra days besides) to do something that I should have done a long time ago: collect past series of posts into a single, easy-to-reference post. The following posts formed my series on computing square roots and logarithms without a calculator. Part 1: Method #1: Trial and error. Part 2: Method #2: An algorithm comparable to long division. Part 3: Method #3: Introduction to logarithmic tables. At the time of this writing, this is the most viewed page on my blog. Part 4: Finding antilogarithms with a table. Part 5: Pedagogical and historical thoughts on log tables. Part 6: Computation of square roots using a log table. Part 8: Method #5: By hand, using a couple of known logarithms base 10, the change of base formula, and the Taylor approximation . Part 9: An in-class activity for getting students comfortable with logarithms when seen for the first time. Part 10: Method #6: Mentally… anecdotes from Nobel Prize-winning physicist Richard P. Feynman and me. Part 11: Method #7: Newton’s Method. I’m using the Twelve Days of Christmas (and perhaps a few extra days besides) to do something that I should have done a long time ago: collect past series of posts into a single, easy-to-reference post. The following posts formed my series on expressions containing nested square roots that nevertheless can be simplified. Part 2: DIfferent ways of calculating . If is even, then means that and . In particular, this is impossible (for real ) if . If is odd, then means that . There is no need to give a caveat on the possible values of . This definition reduces to previous work (like a good MIT freshman), using prior definition for raising to powers that are either integers or reciprocals of integers. Indeed, if , there is absolutely no ambiguity about this definition. Unfortunately, if , then a little more care is required. There are four possible cases. Case 3: is odd but is even. In this case, is undefined if . For example, we would like to be equal to , but is undefined (using real numbers). Case 4. and $latex $n$ are both even. This is perhaps the most interesting case. For example, how should we evaluate ?. There are two legitimate choices… which lead to different answers! So… which is it?!?!?!?! The rule that mathematicians have chosen is that simplifying the exponent takes precedence over the above definition. In other words, the definition should only be applied in has been reduced to lowest terms in order to remove the above ambiguity. For the sake of completeness, I note that the above discussion restricts our attention to real numbers. If complex numbers are permitted, then things become a lot more interesting. If we repeat a few of the above calculations using complex numbers, we get answers that are different!